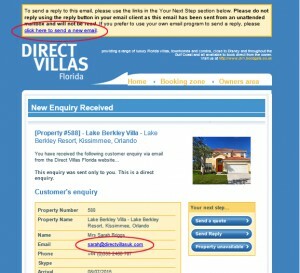 Get the most out of your listing on Direct Villas Florida. Reply quickly and professionally to your enquiries with our easy to use response system. At the same time the holidaymaker receives a confirmation from the site, detailing the property or properties they have sent an enquiry too. 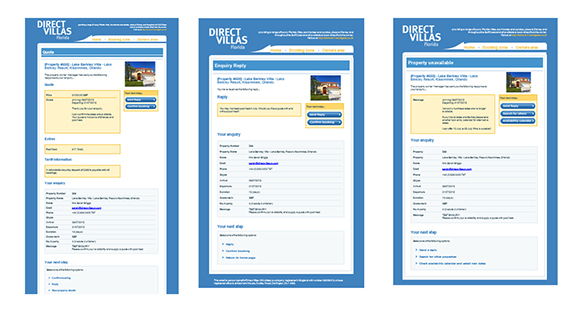 This confirmation includes links back to the relevant property listing page and also to their Booking Zone. 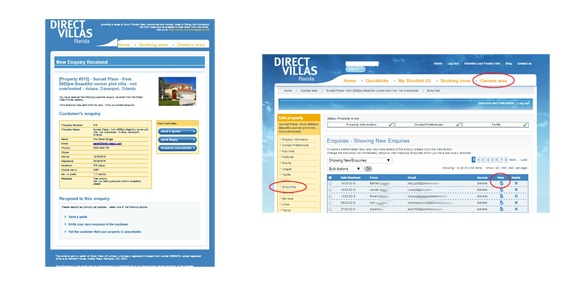 If they have not previously used Direct Villas UK, they will also receive log in details for the Booking Zone. 1.Reply directly from the enquiry notification email using the interactive blue response buttons or the additional reply links at the bottom of the notification. ** IMPORTANT; Do not use your ‘Reply’ button within your email system as this will send your response to a ‘No Reply’ address. Read on to find out to use option 3. Responding with option 3 may be what you’ve always done in the past but it is not as attractive to the prospective guest of your vacation rental as you may think. More on this below. We highly recommend that you take a good look at using methods 1 or 2, the one click response buttons. They are designed not only to make your life easier, but also to help you secure bookings. OPTION 1 and 2 – Where do I find the response buttons? All of these options – Send Quote, Send Reply or Property Unavailable – send a professionally branded email reply, pulling in the details from the original enquiry with the space to add your own personal touch or message to the response. They also include an image of your property and a link back to your own listing page, so if the holiday maker has requested more than one quote they can easily match up your quote to your property. Why not try a test enquiry yourself and you’ll be able to see exactly what a holidaymaker receives? Whilst the built in response system is a great tool – designed to help make your life easier, Direct Villas will not penalise you in any way should you wish to respond using your personal email software. To use your own email programme, simply click the text link ‘click here to send new email ‘contained within the header on the enquiry notification or on the email address link itself. Alternatively, open a new email and copy and paste the email address shown into your email client. Of course you do have yet another option to respond to enquiries. Our telephone contact field is not mandatory, so where an enquirer has supplied a contact number, they may welcome your call. It’s a chance to chat about all the best points of your fabulous vacation home, answer any questions or concerns they may have AND confirm with them, there and then what they need to do to secure their requested dates! Even if you’ve already sent a reply by email that personal follow up can really help seal the deal. Good luck with those bookings! The Direct Villas UK team. This entry was posted on Friday, July 3rd, 2015 at 9:00 am	and is filed under Florida villa owners, Marketing your Florida villa, Uncategorized. You can follow any responses to this entry through the RSS 2.0 feed. You can leave a response, or trackback from your own site.